A good deal. Shortly after the release of the GeForce GTX 670MX and GTX 675MX, Nvidia is unleashing another Kepler graphics card into the race. Contrary to its high-end brothers, the GeForce GT 645M is intended for serving the high turnover mid-range. 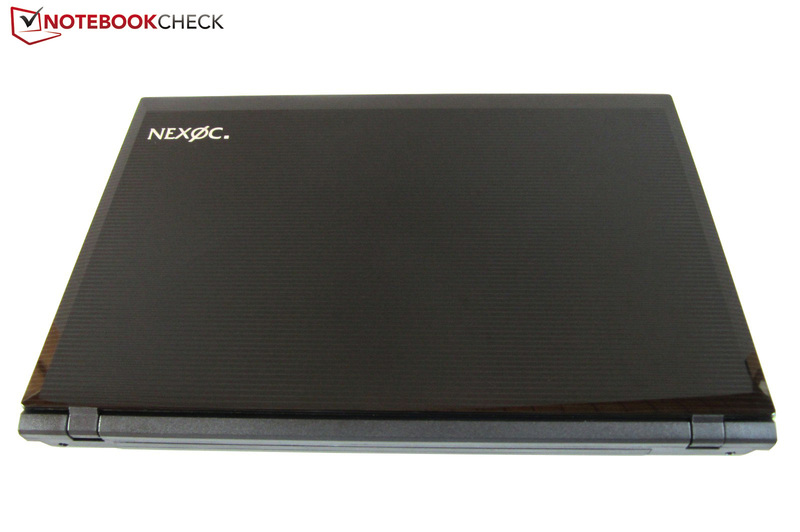 The 15-inch Nexoc M507II is one of the first devices based on this fresh 28 nm GPU. 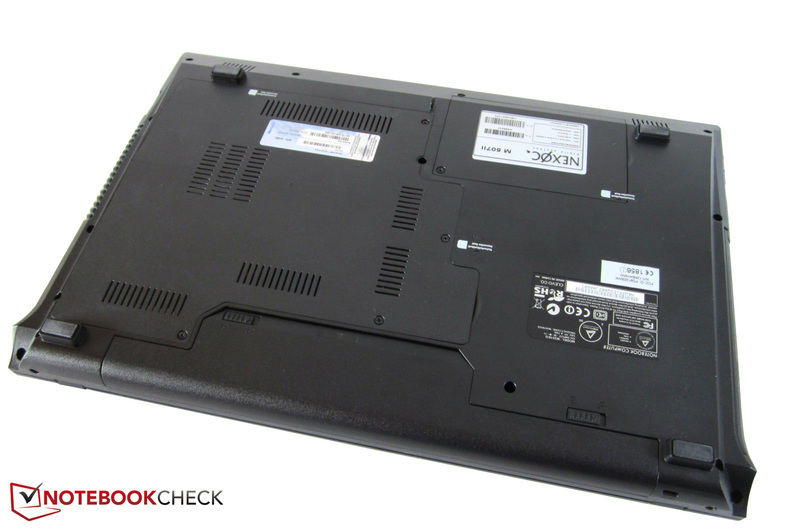 As with its German competitors, Schenker Notebooks and HawkForce, Nexoc don't make their own notebook cases, but instead usually buy them from the Taiwanese company Clevo, such as the Barebone - so called because the inside is filled with hardware once it has been ordered. In other words: the components can be individually selected on the company homepage. To ensure that the processor combines well with the graphics card, the Pentium B960 included as standard should definitely be upgraded. Nexoc provides countless dual- and quad-core processors from Intel's slightly out of date Sandy Bridge generation (2000 series) and the current Ivy Bridge generation (3000 series). Although many games definitely benefit from a quad-core processor in the meantime (see here), the GeForce GT 645M really needs a dual-core equal to or better than a Core i5-3210M. 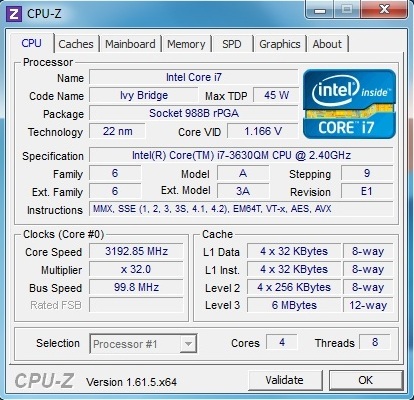 Anyone who is set on having a quad-core processor is probably best served with a Core i7-3630QM in our opinion. The expensive siblings (upwards from the Core i7-3720QM) are hardly worth it from a value for money perspective. The RAM provided as standard on the other hand is decent:4 GB of DDR3 RAM should be more than enough at present (maximum 16 GB). As far as the hard drive is concerned, there is usually a 320 GB Toshiba HDD with a rotational speed of 5400 rpm included. For an additional price it is also possible to integrate 7200 rpm models or lightning fast SSDs. Since the M507II only has one hard drive shaft this decision should be thoroughly thought through. Making a decision when it comes to the optical drive should be easier: Nexoc either integrates a Blu-ray burner or an ordinary DVD burner. 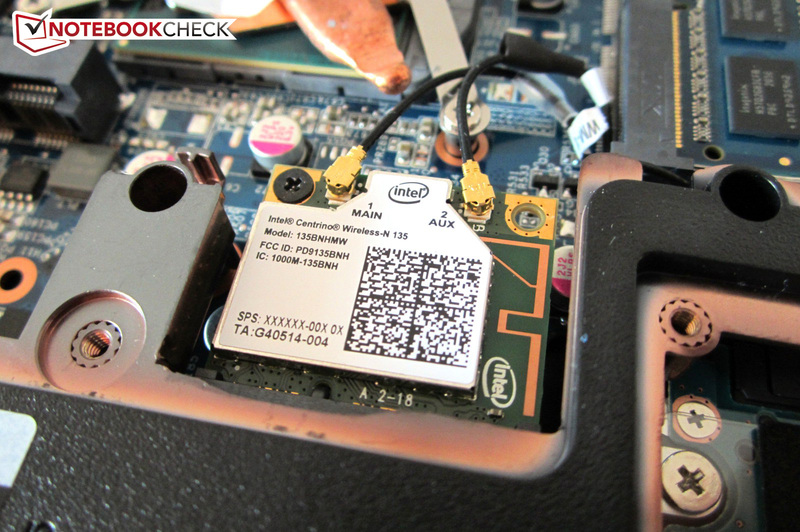 For the wireless module the choice lies between Intel's Centrino Wireless-N 135, Advanced 6235 or Ultimate 6300. An operating system is only installed upon request from the customer. 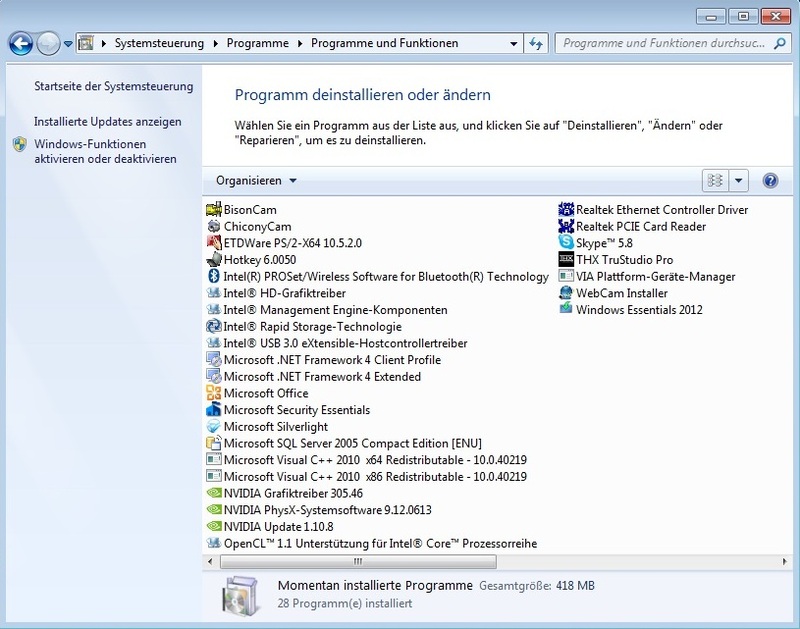 At present the manufacturer, which is based in Bavaria, primarily relies on Windows 7. With a well-rounded hardware mixture the price increases well above the base cost of 589 Euros (~$750). 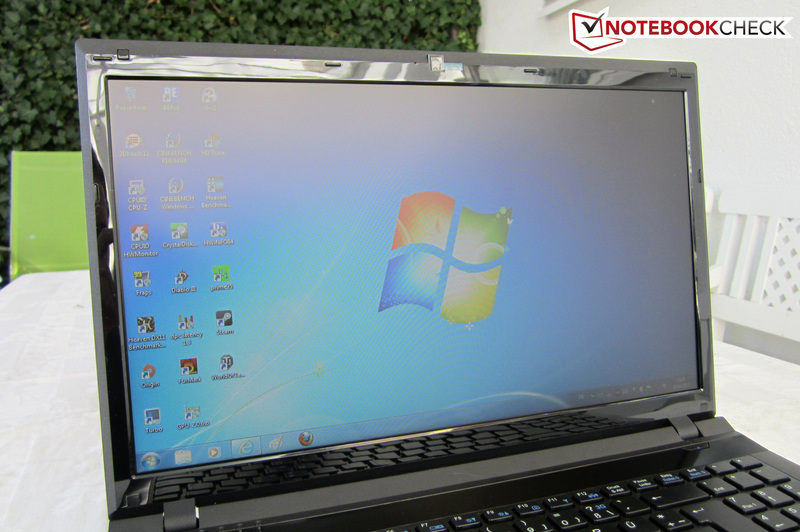 Our reviewed device, which is equipped with a Core i7-3630QM, 8 GB of DDR3 RAM and a 1000 GB HDD, came to a total cost of 965 Euros (~$1229, including Windows 7 Home Premium 64-bit). The W251EG(Q) chassis, which forms the basis for the device, is more or less the same as the E5121Q-Barebone (Schenker Xesia E510) we tested in 2011. The dark black surfaces look very nice at first glance, but turn out to be very sensitive as a result of their high gloss finish. Anyone who doesn't clean the case regularly will be confronted by fingerprints, streaks of various kinds and other blemishes. Special care and attention is required when it comes to the scratch-prone display frame. Visually the 15-inch notebook makes a decent impression. While the shape is rather unspectacular, the lid and the palm resting area stand out positively with a fine pattern of lines. Compared to the more expensive W150ER-Barebone, which contains Nvidia's GeForce GT 650M, the W251EG(Q) is not only a little bit lighter (2.5 vs. 2.8 kg), but also somewhat slimmer (4.3 vs. 4.7 mm). Even more pronounced differences become apparent when it comes to the AC adapter (370 vs. 735 grams). The W150ER meanwhile stands out positively with a blemish resistant finish, a sharper display, more interfaces, and two 2.5 inch shafts (Schenker XMG A502). Let's get to the stability of the Nexoc M507II, which doesn't exactly turn out to be outstanding. The lid can easily be dented inwards considerably in the center, and the base unit gives way around the area of the optical drive as usual. The notebook is by no means rickety though, and not taking into consideration any base unit vibrations the hinges do their job quite well. Combined with the decent manufacturing quality we would rank the chassis as "good" all considered. The multimedia products from bigger manufacturers, such as Asus, Sony or Toshiba, don't necessarily perform any better in this category. The selection of interfaces is relatively unspectacular. Not considering the two modern USB 3.0 ports, users are only provided with the standard options. Starting off on the left side, there is a RJ45 Gigabit LAN port, followed by a VGA port and the power input towards the back. Above the cooling vent is a digital HDMI output and the aforementioned USB 3.0 ports. To top it all off, there is also an eSATA port and a 9-in-1 card reader. The right side is not quite as well equipped. Along with the optical drive, there is a USB 2.0 port and two audio sockets (surround sound only via HDMI). 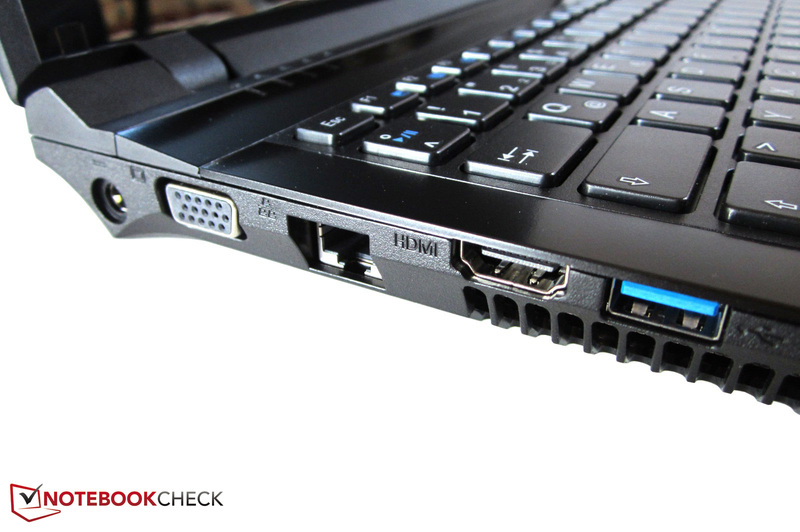 For comparison: the W150ER-Barebone is equipped with three audio sockets and three USB 3.0 ports. The location of the ports is unlikely to be ideal in everyone's opinion. While right-handed users will unlikely encounter any difficulties using an external mouse, left-handed people could find the flow of warm air and limited maneuverability an issue. The front and back don't offer any possibilities for connectivity. According to the manufacturers information the webcam has a resolution of 2.0 megapixels. 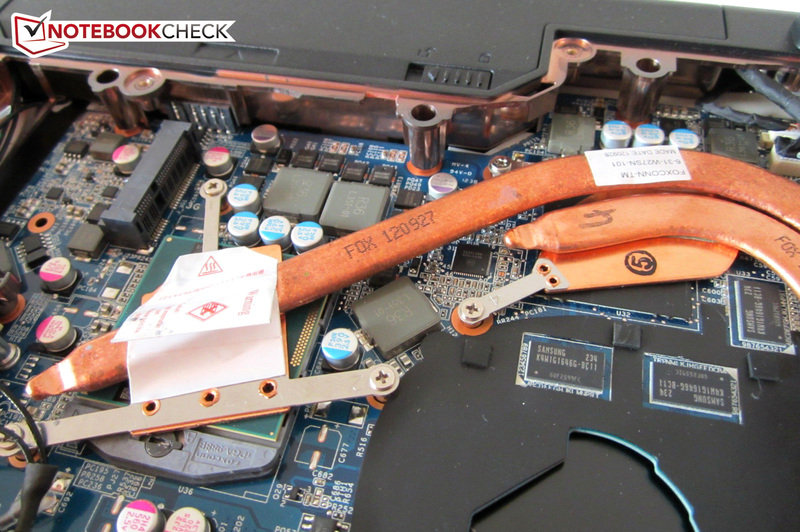 The maintenance of the notebook is relatively easy. 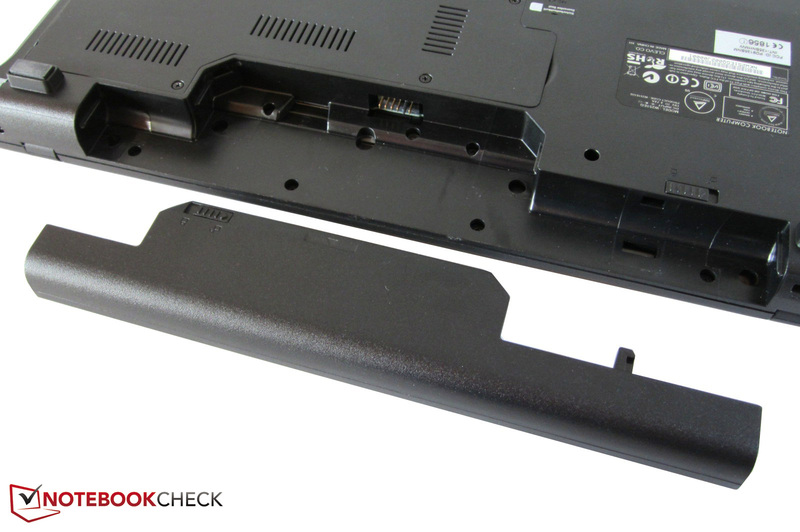 With the help of a conventional Phillips screwdriver, users can remove both of the two maintenance panels without any difficulties. Since the cooling fan is screwed to the bottom of the case and is cabled to the mainboard, care should be taken when lifting off the larger of the two panels. Otherwise, the maintenance seemed to be quite comfortable to us, and changing the RAM would theoretically also be possible for a layman. Contrary to the soldered on GPU, the wireless module and CPU can both be upgraded. 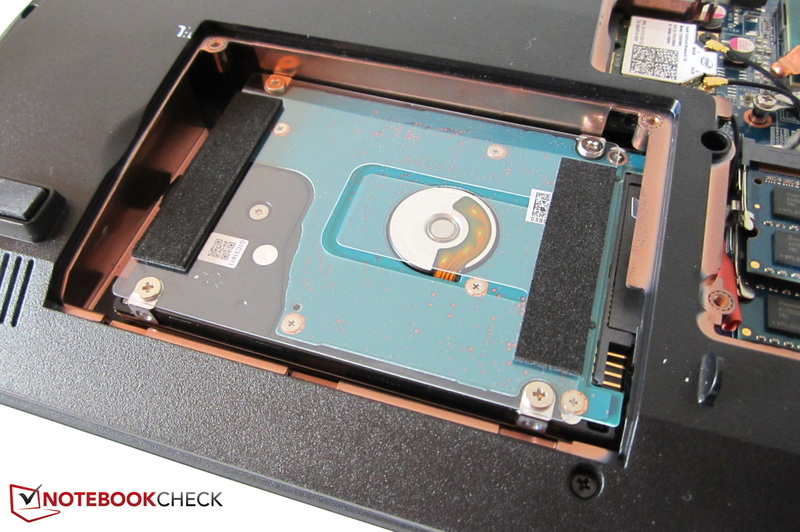 Underneath the small maintenance panel there is the 2.5-inch hard drive (maximum height 9.5 mm). The wireless module Centrino Wireless-N 135 included as standard supports Bluetooth 4.0 and Wi-Fi Direct, along with the usual standards 802.11 b/g/n. 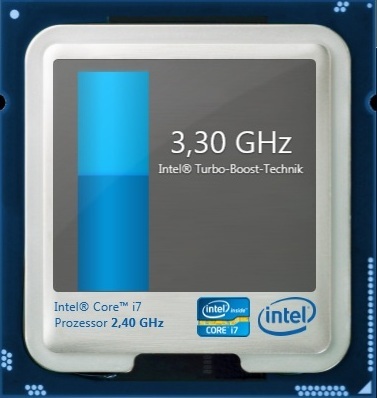 According to Intel, the data rate can reach up to 150 Mbit/s (2.4 GHz). Praise is due to Nexoc for the clean install of Windows among other things. Instead of burdening the notebook with oodles of bloatware, the manufacturer has concentrated on the necessary drivers and thanks to Windows Security Essentials the downloading or buying of an anti-virus product is no longer required. When ordering an operating system, buyers will also receive a full-fledged Recovery DVD (service pack 1 is already pre-installed). Our package also contained Multimedia Suite from Nero, a short user guide, and a driver DVD. 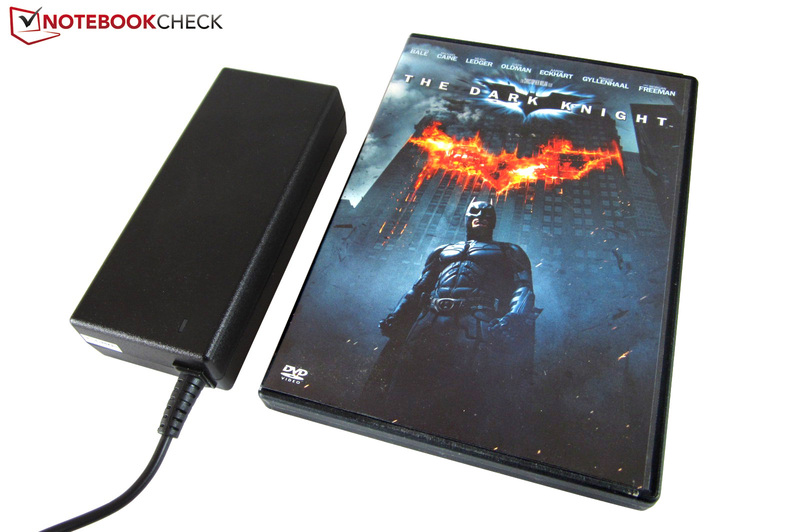 The dainty 90 watt AC adapter should also fit into any notebook bag with its dimensions of 130 x 55 x 30 mm. 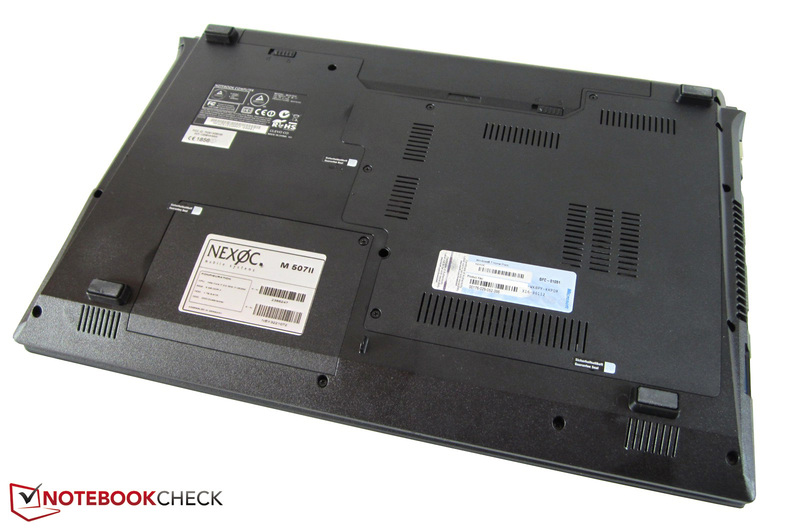 Nexoc provides the 15-inch notebook with a two year warranty. Those wanting to be covered for three years will have to cough up about 65 Euros (~$82) extra - a fair price. In addition, there is also a 72 hour service (12 months, ~20 Euros, ~$25) and a pickup service (24 months, ~25 Euros, ~$31) on offer. 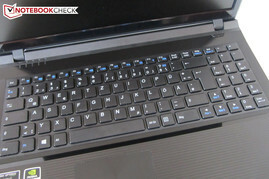 We are already well familiar with the matte chiclet keyboard which has previously been used in several Barebones. Not surprising: Clevo has already been using the respective model for quite some time. The rounded individual keys have dimensions of 14.5 x 14.5 mm, and provide decent typing haptics. The end stop and pressure point will satisfy most buyers. The layout on the other hand is unlikely to please everyone. The reason: Clevo has included a three column numeric keypad with "half" a 0 button. A further negative aspect: depending on the typing force, the keyboard sometimes sounds a bit like it is rattling. 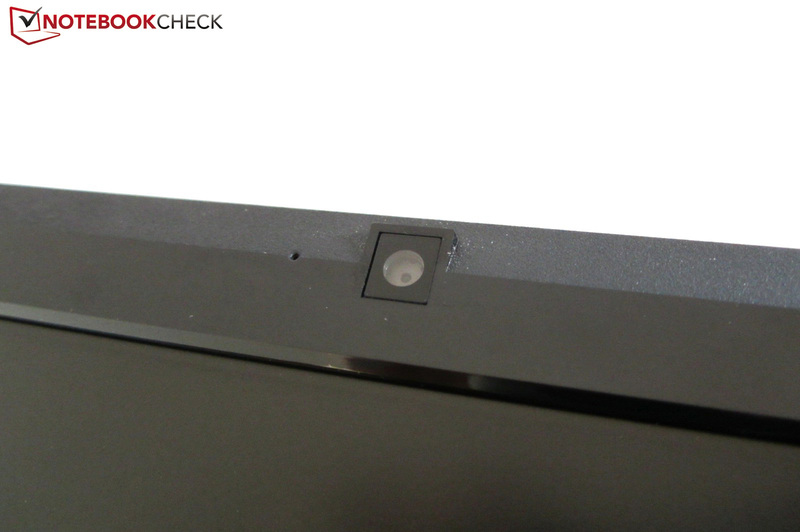 Important comfort functions, such as for changing or (de-)activating the display brightness, volume, touchpad, webcam or the wireless module, are marked with blue, and are primarily lined up along the narrow F-row. 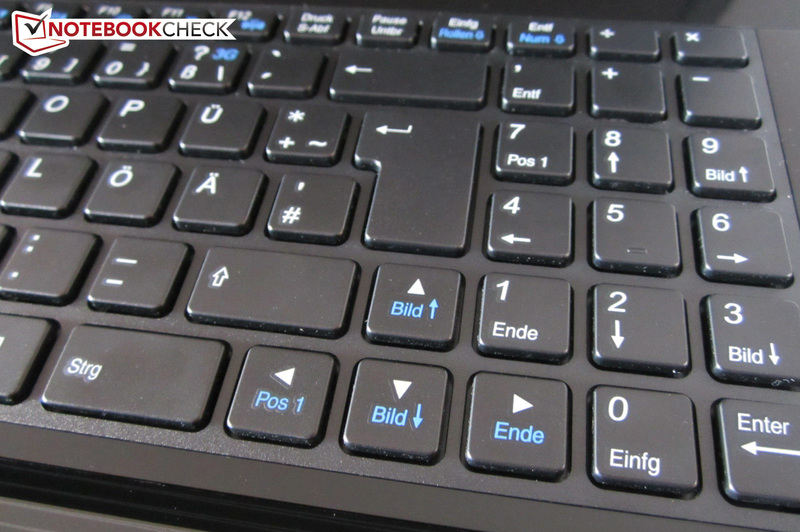 Note: some Clevo models, such as the P150EM (Schenker XMG P502 PRO) contain a backlit keyboard. 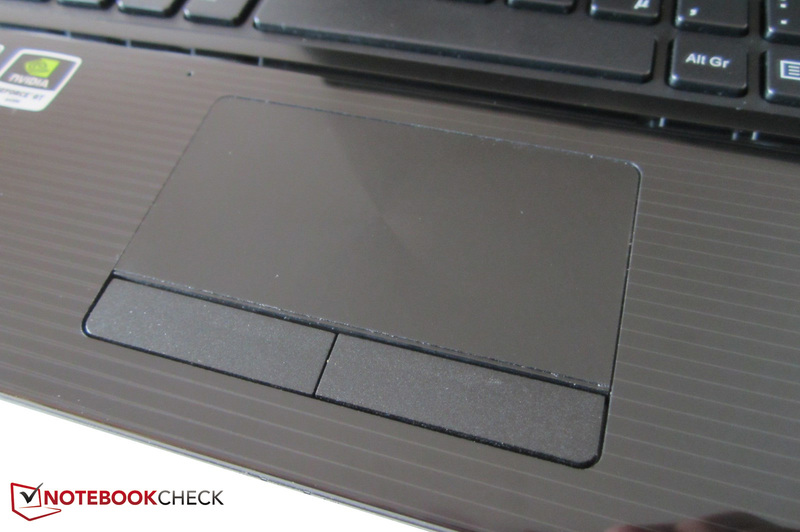 The touchpad left a conflicting impression: thanks to the circular structure on the surface - and despite the absence of a lowered or colored area - the location of the touchpad is still discernible, but lacks in terms of its gliding properties. At least the operation feels more pleasant than with the W150ER-Barebone (characteristic of "sandpaper"). 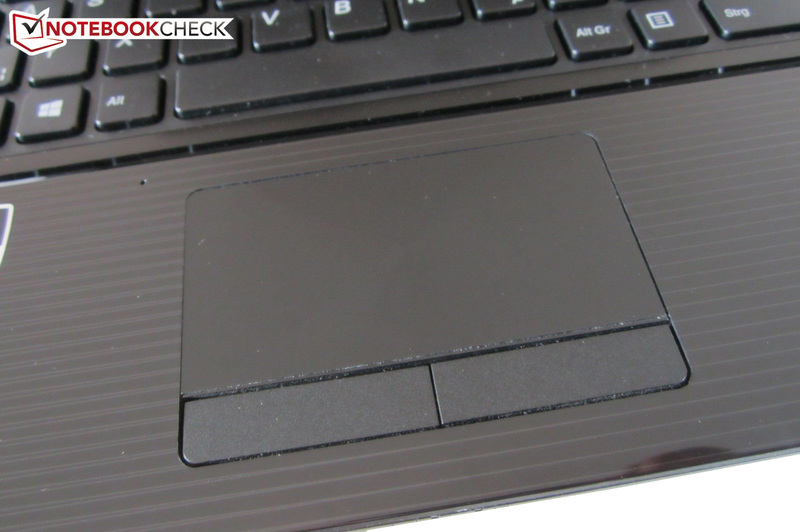 Considering the rubbery W350ET (Schenker XMG A522), touchpads certainly don't seem to be one of the strengths of Clevo. During daily practical use the mouse replacement works quite well. The 87 x 46 mm dimensioned Elan Smart Pad can be used to control the mouse pointer reasonably quickly and precisely. Multi-touch support is also included. With the use of two or three fingers, it is possible to scroll, turn, flip and zoom the display content. The last of these functions was unfortunately quite stubborn in our test. Great: the horizontal and vertical scrolling with the edge of the touchpad is already enabled when the notebook is first started. The two mouse buttons could be a touch better defined in our opinion though. The quality of the 15.6-inch non-glare display (16:9 aspect ratio) unfortunately didn't meet our expectations. Although Clevo primarily opts for relatively high-quality display panels, the W251EG(Q) regrettably has to make do with an average 08/15 product. We were primarily disappointed by the black level; 1.5 cd/m² provides an extremely gray image in dark areas (immediately noticeable when booting). In order to achieve a luscious black, this value would have to be lower than 0.5 cd/m². The brightness of the LG LP156WH4-TLP2 panel is also not sufficient: 222 cd/m² may be enough for indoor surroundings, but outdoors the luminance deficiency will quickly come to light (comparison outdoor pictures). Extrapolating the contrast of the display from our reviewed device led to a ratio of 151:1 - meager. As the Schenker XMG A502 shows, LG does have genuinely good models in their product line. The Full HD version LP156WF1 for example reaches a contrast of 600:1, and is therefore approximately four times better. Due to the lackluster colors (the panel already runs into difficulties with the sRGB color space) the movie and gaming atmosphere is additionally curtailed. Those that are keen on multitasking could be especially irritated by the low resolution. 1366x768 pixels is no longer up to date in 2012. Depending on the application, a lot of scrolling could be required with a single window. It's a shame that Nexoc is not offering the HD+ version with 1600x900 pixels, which is also available according to the Clevo handbook. For less demanding games the graphics card would have enough performance reserves. The narrow viewing angles are a further weakness of the TN panel. Regardless of whether horizontal or vertical: the picture changes after minimal deviations from the center. As an entertainment platform for several viewers the notebook is not an ideal candidate. Verdict: without an external monitor neither work nor use as a media device will be much fun. Clevo doesn't only forgo potential in this case, but also a few ratings points. With the introduction of the Ivy Bridge generation in 2012, Intel reduced the manufacturing process from 32 to 22 nm. As with their predecessors, the current dual- and quad-core models contain between 3 and 8 MB of L3 cache. The efficient architecture, Hyper-Threading technology (simulation of virtual cores) and Turbo Boost function (dynamic overclocking), all combine to provide a high performance potential. The TDP for standard models lies at 35 watts (dual) and 45 watts (quad). 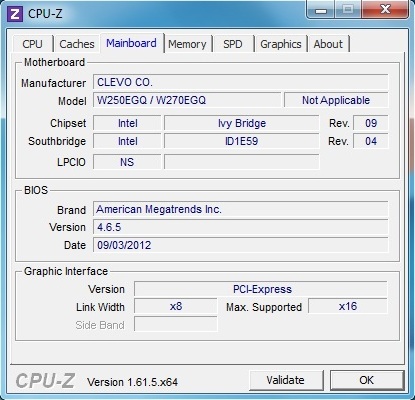 Common to all Ivy Bridge models is the integrated graphics chip. 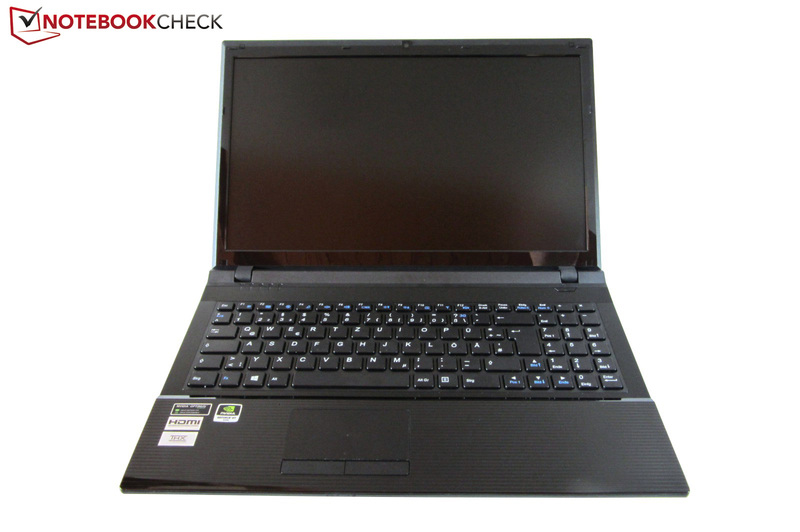 Since Clevo has equipped the notebook with Nvidia's Optimus technology, the Nexoc M507II is able to switch between the HD Graphics 4000 and the GeForce GT 645M as required. Advantage: for less demanding graphics tasks power is not unnecessarily wasted. Our reviewed device was equipped with the quad-core 2.4-3.4 GHz Core i7-3630QM, which is able to put to use 1.4 billion transistors, and slightly outclasses the GPU. A look at Cinebench R10 reveals that the CPU doesn't always release its full potential when it is utilized. 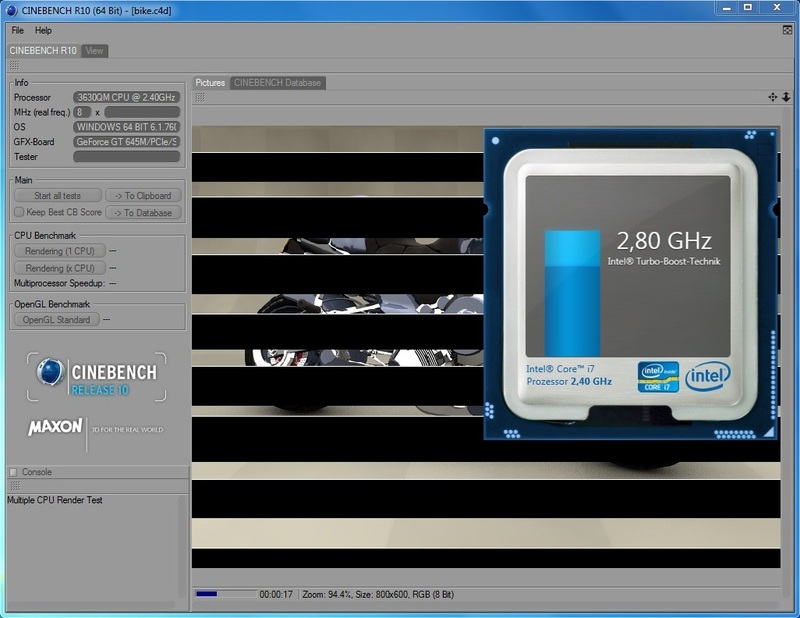 While 3.2-3.3 GHz is quite substantial during single-core rendering, the Core i7-3630QM only manages about 2.6-2.9 GHz during multi-core rendering. 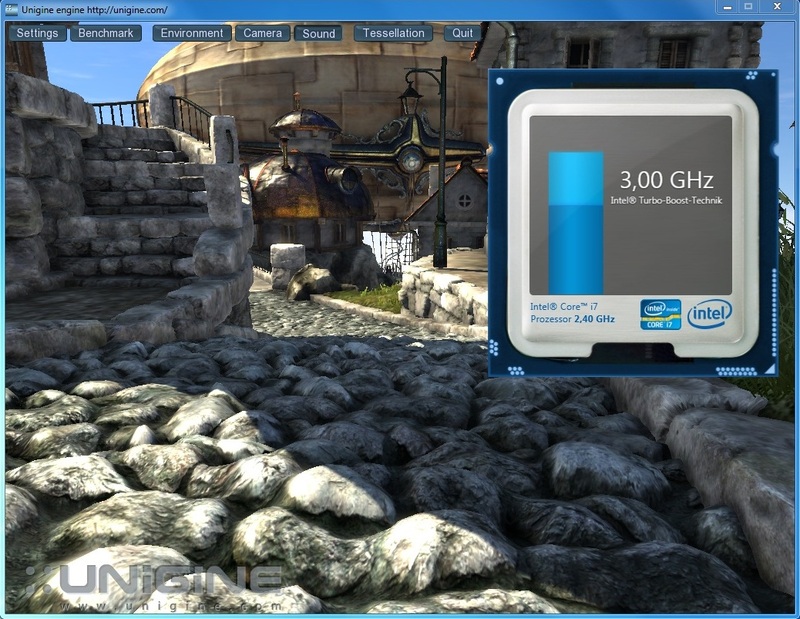 With the Ugine Heaven benchmark, which utilizes the graphics card in parallel, the value was between 2.9-3.1 GHz. In light of the high temperatures, the suspicion arises that the cooling system is frequently operating at its limit. The CPU throttling when fully utilized (1.2 GHz) confirms this theory. Other Clevo Barebones suffer to an even greater extent. With the 15 inch brothers W150ER and W350ET for example, the CPU Turbo is completely deactivated as soon as the Nvidia GPU is enabled - a questionable decision. Intel's Ivy Bridge product line currently dominates the notebook segment without question. The quad-core models especially deliver a performance worthy of respect. 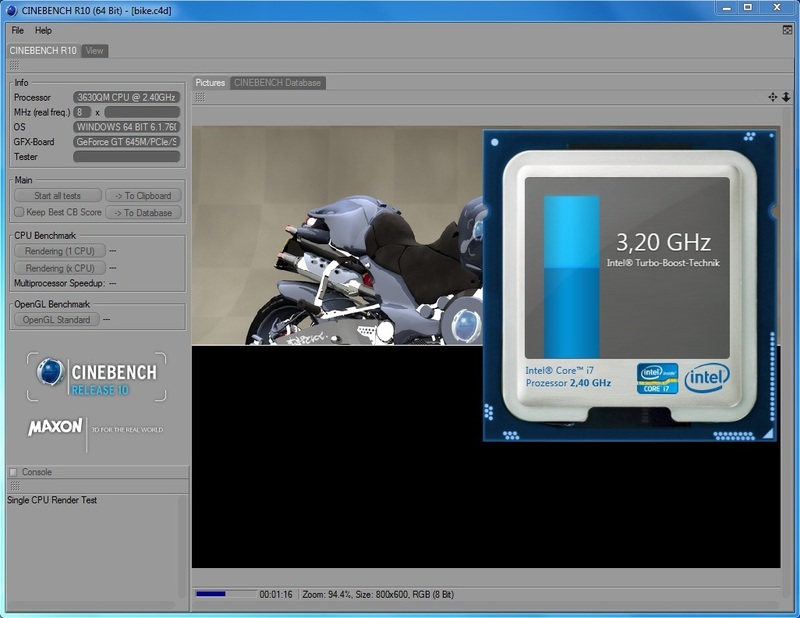 Let's take Cinebench R11.5 for example: with 5.52 points, the Core i7-3630QM sprints effortlessly past its other dual-core siblings during single-core rendering. The 2.5-3.1 GHz Core i5-3210M (Toshiba Satellite L850-153) is only ascribed a score of 2.9 points, which represents a shortfall of almost 50%. When it comes to multi-core rendering the Intel chips begin to bunch up noticeably in terms of performance, and the lead of the Core i7-3630QM shrinks to about 10% (1.41 vs. 1.27 points) in this case. Since most 3D programs are limited in terms of graphics though, most average users should be satisfied with a dual-core variant. The GeForce GT 645M is in effect a faster version of the popular GeForce GT 640M. In order to achieve a certain performance improvement, Nvidia has raised the core speed by 14%, from a previous 625 MHz to 710 MHz. As our speed measurements attest, the speed increase has a varying impact on the overall performance improvement. The texture fill rate is also about 14% higher (22.7 vs. 20.0 GTexels/s) than that of the GT 640M. In many other disciplines the Kepler models are equal. Both GPUs have 384 shaders (also called CUDA cores), a memory speed of 900 MHz, and a 128-bit wide interface (maximum bandwidth 64 GB/s). 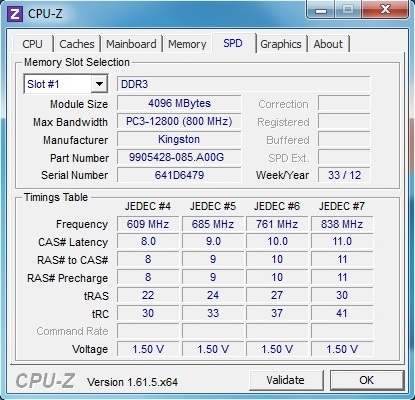 Depending on the notebook and the manufacturer, either DDR3-VRAM or the modern GDDR5-VRAM is adopted. 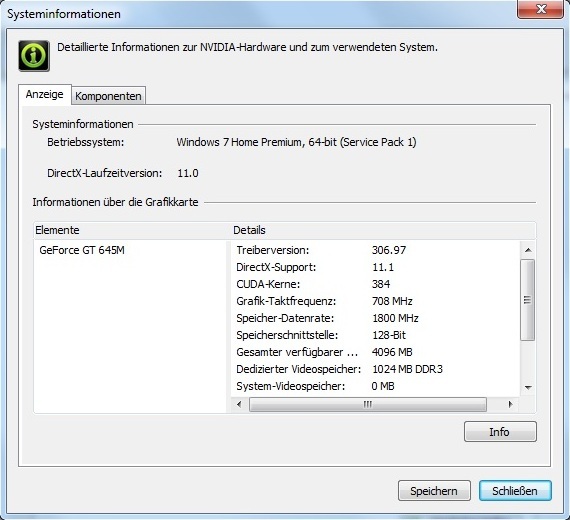 The expensive GeForce GT 650M doesn't only provide a fast core speed (735 MHz as standard), but also a higher texture fill rate (maximum 27.2 GTexels/s) and a wider bandwidth (maximum 80 GB/s). 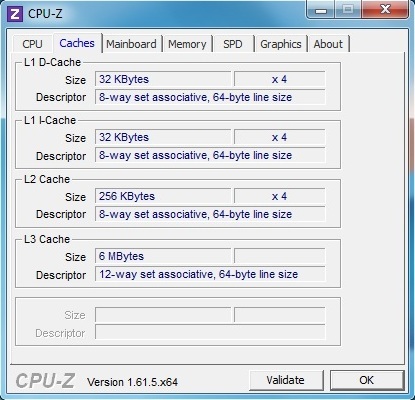 The number of shaders is also identical, as is the interface, and the possible memory types. The memory size can vary between 1024 and 2048 MB. All Kepler graphics cards are manufactured using the current 28 nm process. 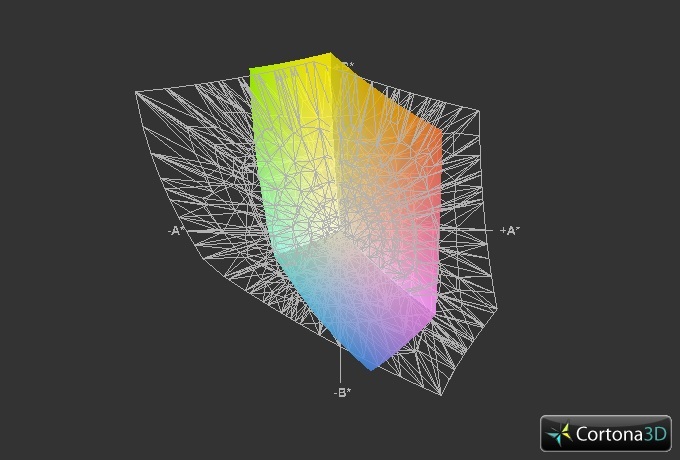 Along with DirectX 11.1 and OpenGL 4.1, the GT 645M also supports a diverse set of features and technologies (e.g. PhysX). Similarly to Intel's Core-iX CPUs, Nvidia's Kepler generation is also able to improve the overall performance with dynamic overclocking. 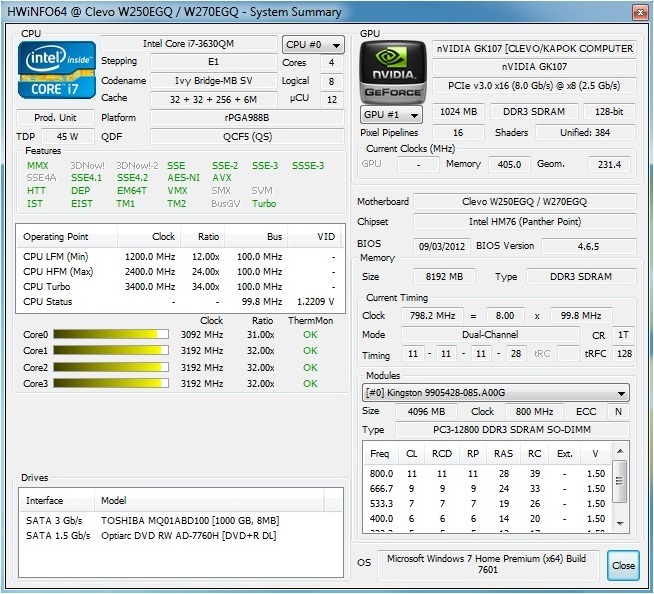 In the case of the GeForce GT 645M, the core speed is raised from 710 to 780 MHz when utilized (+10%). Laudable: Clevo has designed the W251EG(Q)-Barebone in such a way that the graphics card always operates at its maximum speed during 3D applications. Even during the unrealistic stress test (full utilization with Furmark and Prime) the GPU-Z tool always showed 780 MHz. 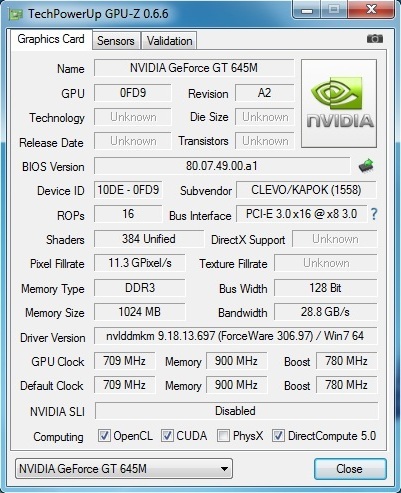 With DirectX 11 programs the GeForce GT 645M performs considerably well. The demanding Unigine Heaven 2.1 benchmark may have got the Kepler GPU to work up quite a sweat with 1280x1024 pixels, high details and normal tessellation, but the result was still a somewhat smooth 24.8 fps. With this the graphics card ranks about 14% slower than the GeForce GT 650M (28.8 fps @ One M73-2O). 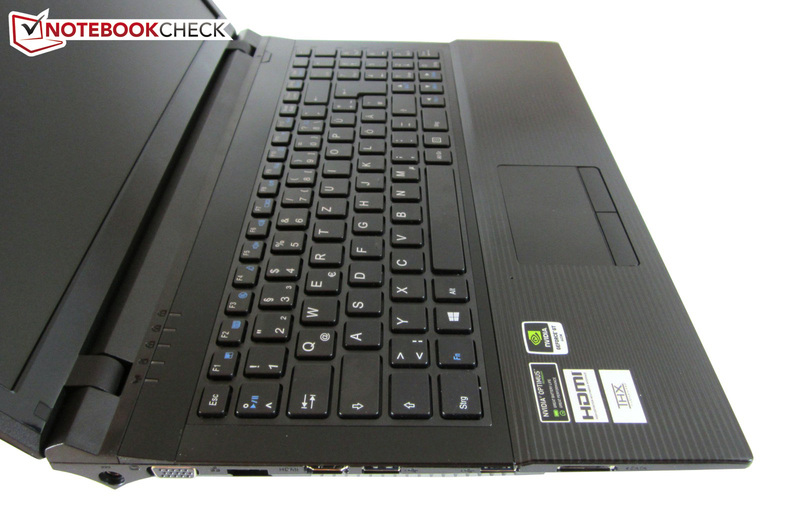 The smaller sister model GT 640M falls behind by about 6% (23.5 fps @ Acer TravelMate P653). With the 3DMark 11 (1280x720, performance preset) the GeForce GT 645M is able to clearly outperform its smaller sister model: with 1941 vs. 1709 points (Gigabyte U2442N) the new Kepler model has a performance advantage of about 14%. 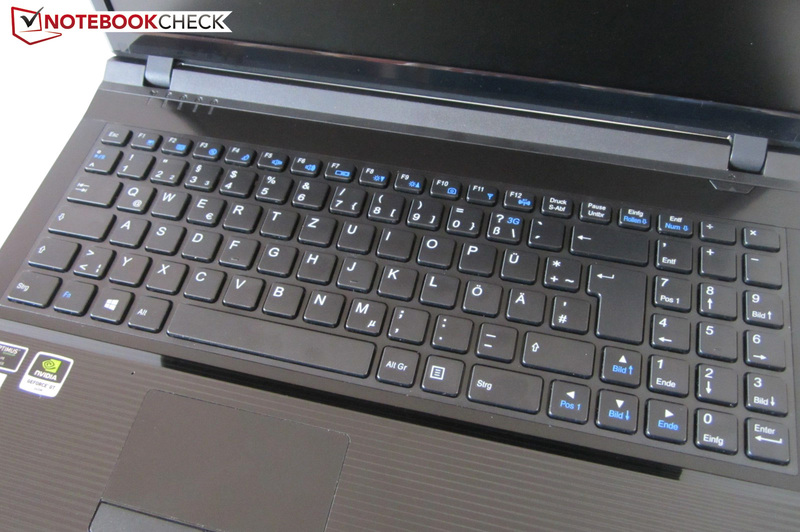 The GeForce GT 650M wins the in-house competition by about 8% (2099 points @ Dell Inspiron 17R). How the situation plays out in practical gaming terms will be determined more accurately below. As already mentioned in the introduction, there are several different hard drives available for selection. 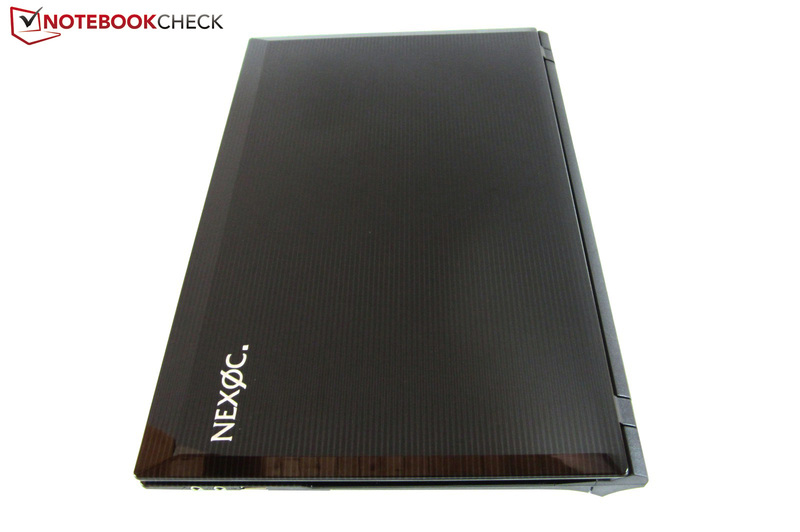 Along with HDDs with 5400 or 7200 rpm (320-1000 GB), Nexoc also provides hybrid versions (500-750 GB) and SSDs (128-512 GB). Since Solid State Drives are still relatively expensive, and our reviewed device should stay below 1000 Euros (~$1274), we decided to opt for a classical HDD. 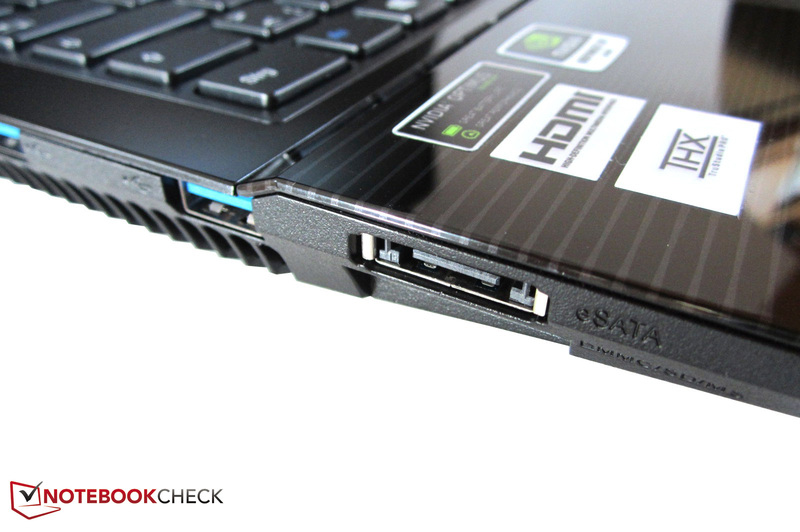 In the case of the Toshiba MQ01ABD100 we are dealing with a successful SATA II model, which has already proven itself countless times in the past. Thanks to the high capacity of one Terabyte, the HDD is able to occlude its meager rotational speed (5400 rpm) surprisingly well. 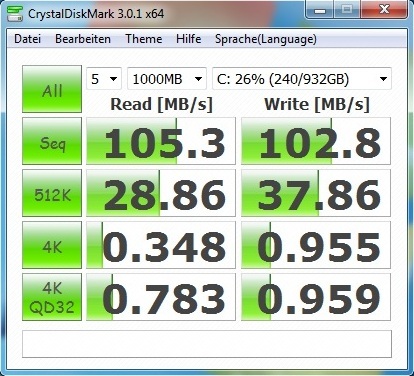 CrystalDiskMark underscores this assertion: in the sequential read and write test we determined over 100 MB/s. 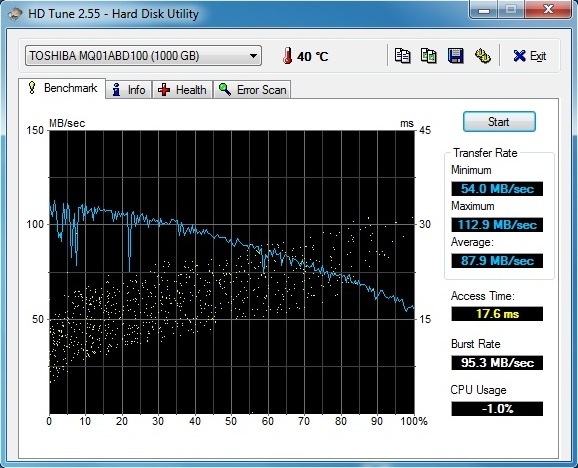 Conventional 5400 rpm HDDs usually provide significantly less than 100 MB/s, and often fluctuate between 60-80 MB/s. In some cases the MQ01ABD100 is even able to compete with 7200 rpm HDDs. According to HDTune, the average access time lies at about 17.6 ms. The Toshiba is of course worlds away from an SSD in terms of speed. With a Solid State Drive the operating system feels substantially faster and reacts more quickly (keywords: boot time & start times). 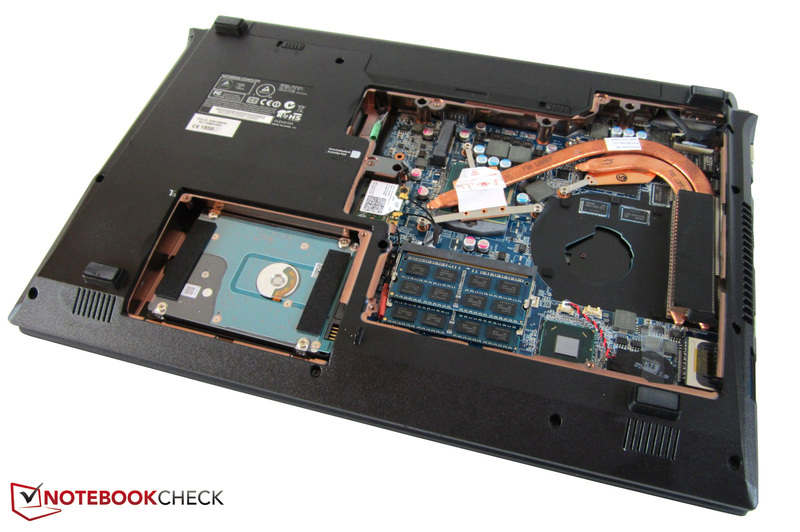 The overall performance of our reviewed notebook ranks among the upper mid-range. 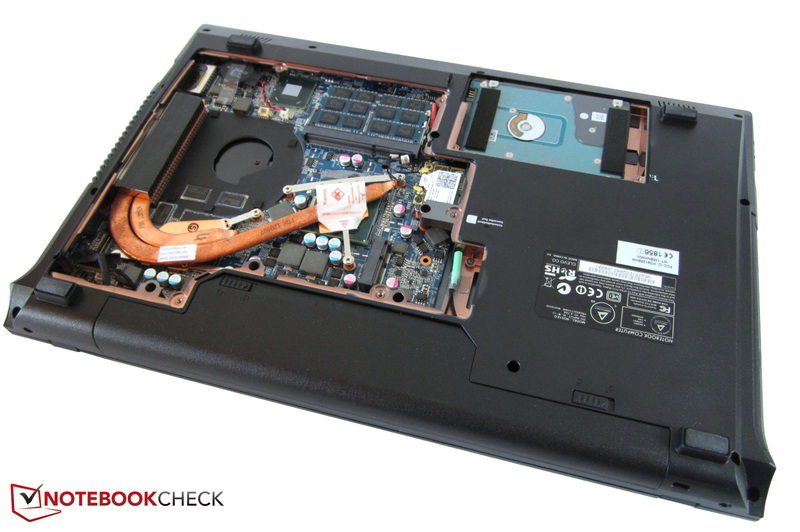 9586 points in PCMark Vantage is not ascribed to every all-round notebook. 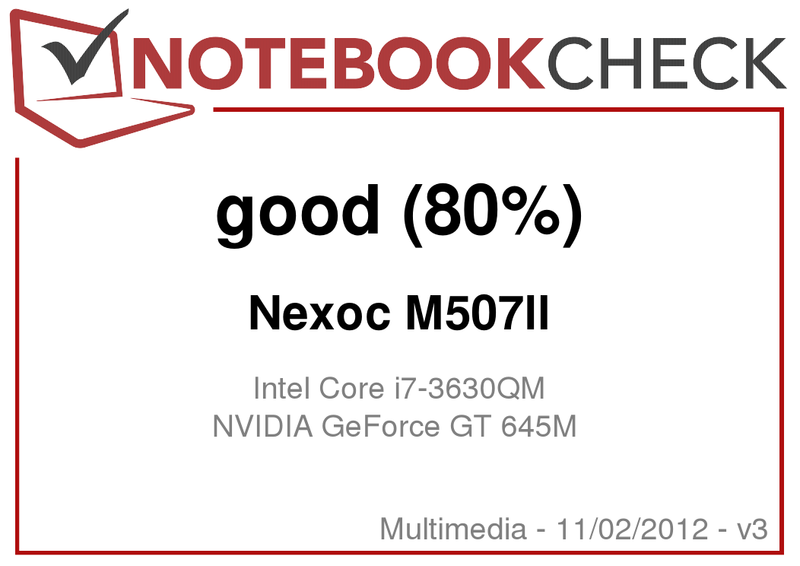 With this result the Nexoc M507II marginally outperforms the Dell XPS 15 (9545 points @ Core i7-3612QM + GeForce GT 640M), and lies just behind the Dell Inspiron 17R (9702 points @ Core i7-3610QM + GeForce GT 650M). More than 10,000 points is almost impossible to achieve without an SSD anyway. Current top of the range models, such as the Alienware M18x R2, sometimes even manage to score more than 20,000 points. High details often drive the GT 645M to its limits. A general verdict regarding the gaming performance is difficult to reach. The reason: the frame rate is highly dependent on the selected resolution. 1920x1080 pixels should only be used with the Kepler GPU with less demanding games, such as FIFA 13, Dishonored or Counter-Strike: GO. With technically demanding games, such as Dirt: Showdown, Skyrim or Anno 2070, players will have to be content with resolutions of 1600x900 or 1366x768 pixels. In very extreme cases it is also impossible to get around having to reduce the quality settings substantially. 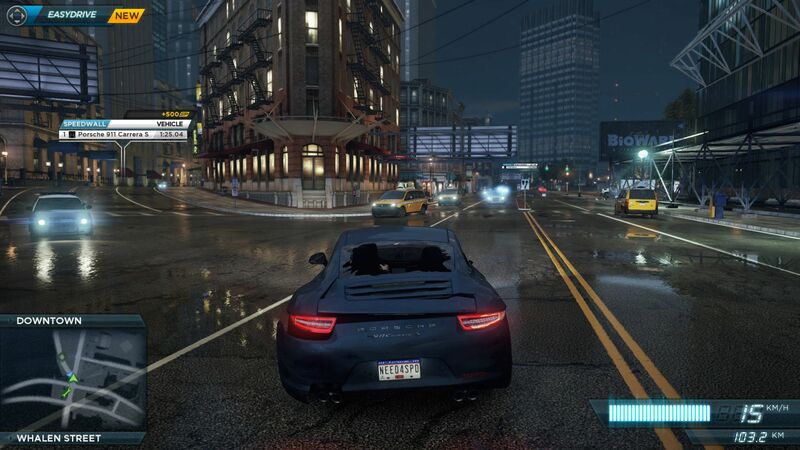 Some games (including Alan Wake, Sleeping Dogs & Battlefield 3) are only playable with normal settings. In some cases it is also enough to disable anti-aliasing, or to forgo certain graphics options (e.g. tessellation in Max Payne 3). Conclusion: the GeForce GT 645M is primarily intended for occasional gamers that don't necessarily need to play every new game with the maximum graphics settings. When taking all the tested games into account the DirectX 11 GPU outperforms the GT 640M (DDR3) comfortably by 10%. Compared to its bigger brother the graphics card usually doesn't stand a chance though, and the GDDR5 version of the GT 650M is able to extend its lead to 15%. Altogether, the GeForce GT 645M represents a good compromise between performance, heat dissipation and power consumption. In case a more precise comparison of the three Nvidia GPUs is required: below the article is a detailed table. The system noise made a convincing impression on us in an idle state. When the system is hardly utilized at all the Nexoc M507II behaves fairly quietly, and the cooling fan turns at a leisurely pace with a relatively low speed (32-34 dB from a distance of 15 cm). A faint, but in no way disturbing, hard drive clicking is also audible from time to time. 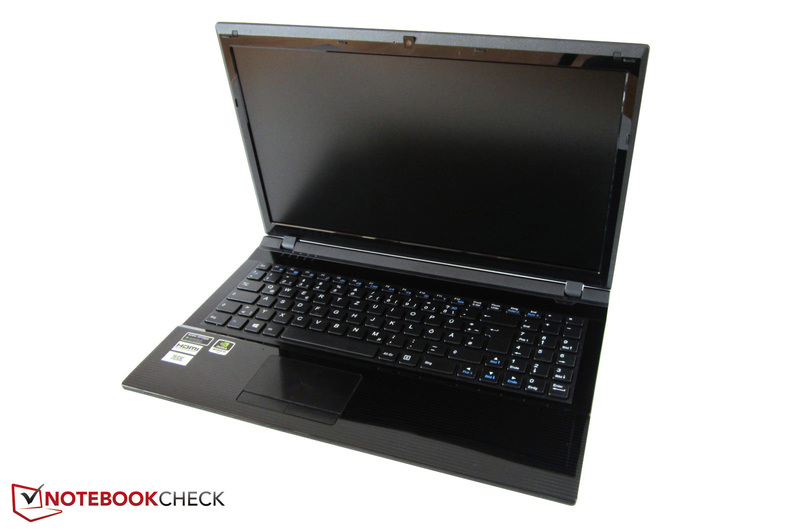 During gaming use the 15-inch notebook is not especially quiet. 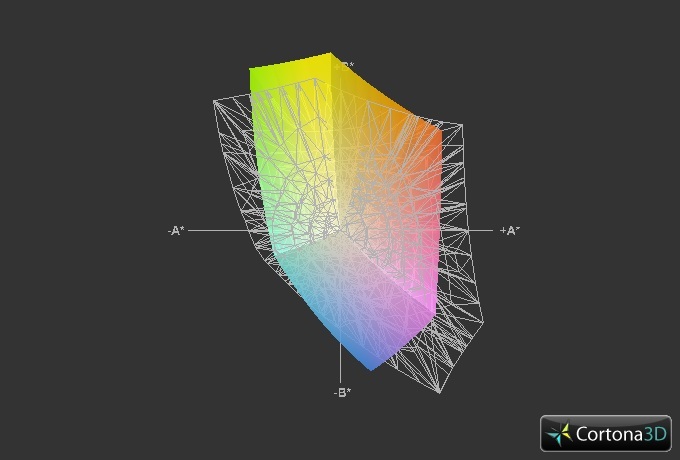 While running 3D programs, the cooling noise quickly rises to a clearly audible level. 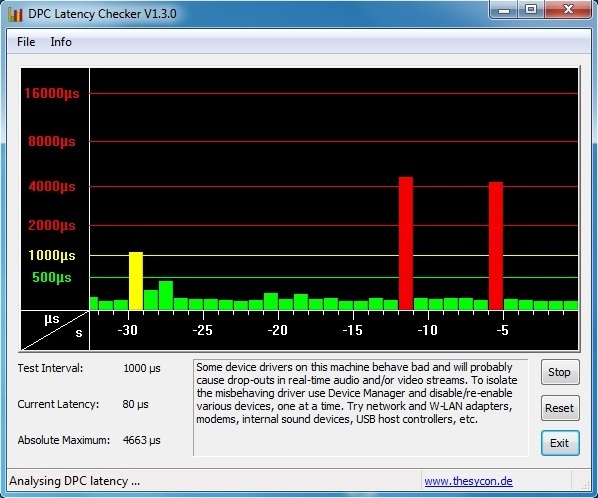 Our standard test with 3DMark 06 elicited an average system noise of 46 dB. Depending on the genre or the stage in a game, the audio is not necessarily always trumped by the system noise though. Loud games such as Medal of Honor: Warfighter can be enjoyed reasonably well. 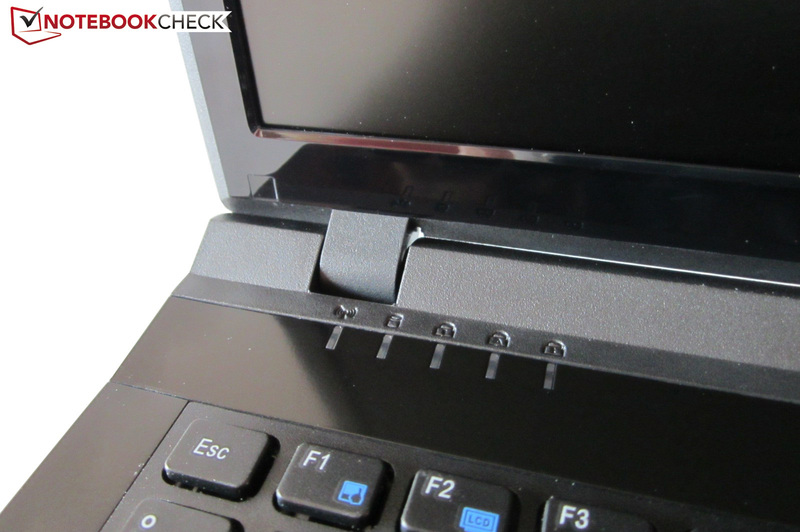 Sensitive users will nevertheless still find the notebook to be less than ideal. 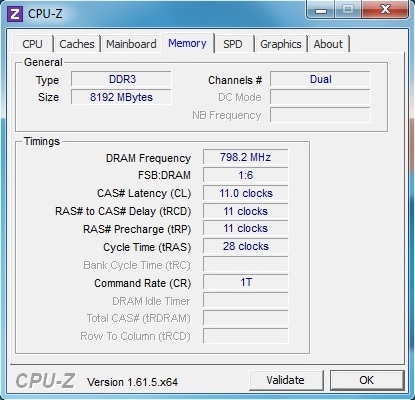 Due to the disabled CPU Turbo the volume only increases marginally to 47 dB when the system is fully utilized. The optical drive reaches 36 dB when reading media. The high temperatures are definitely one of the biggest weaknesses of the W251EG(Q)-Barebone. Despite CPU throttling to 1.2 GHz the components still got quite hot during the stress test. Assuming that the CPUID hardware monitor is correct (right screenshot), then the Core i7-3630QM sometimes heats up to in excess of 90 °C. 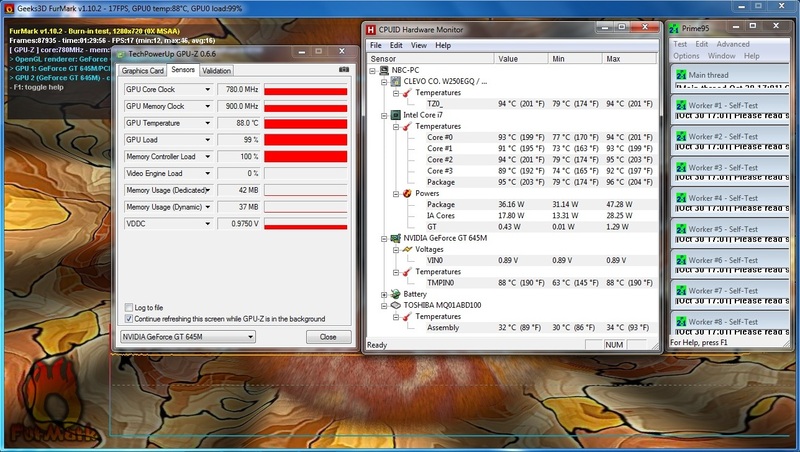 A GPU temperature of 88 °C maximum is also relatively high. Values such as these are still not classified as critical, especially since the hardware is considerably cooler under normal conditions. On the subject of cool: in an idle state the case consistently remains within acceptable limits. Two hours in an idle state results in about 28 °C. With processor intensive applications the result doesn't quite turn out to be as positive: after 60 minutes of the stress test the top surface temperature increased to 46 °C in the WASD key region (average: 37 °C). The bottom surface proved to be a little on the cooler side with an average of 33 °C (maximum 41 °C). It is definitely worth mentioning that there are some multimedia competitors that get considerably hotter (e.g. the Acer Aspire V3-571G or the DevilTech Fire DTX). (±) The average temperature for the upper side under maximal load is 36.9 °C / 98 F, compared to the average of 30.9 °C / 88 F for the devices in the class Multimedia. 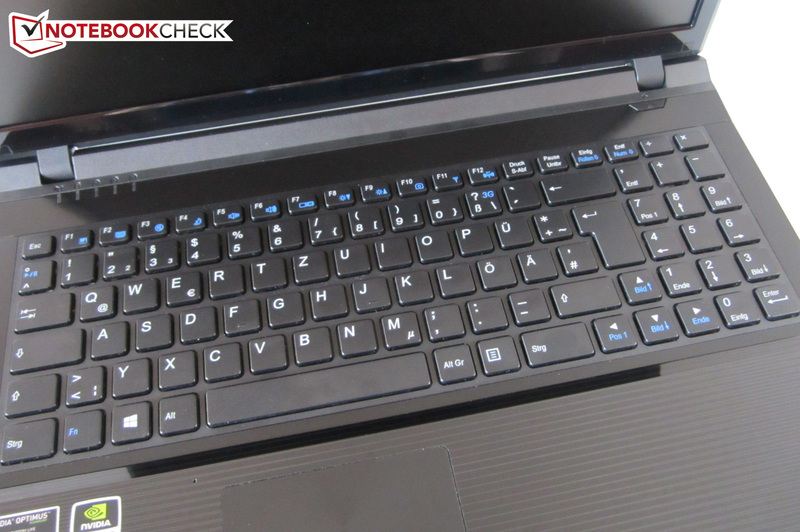 The two speakers are hidden below the front of the notebook, contrary to their conventional location above the keyboard. 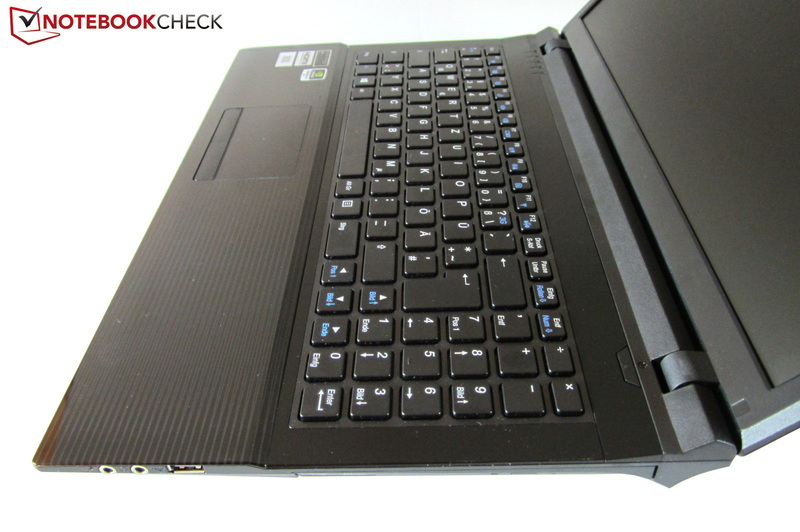 Clevo has remained faithful to its lineage and has equipped the notebook with the THX TruStudio Pro technology, which makes the audio sound expectedly more whole and wider. With the pre-installed THX tool it is possible to switch the individual audio enhancements on and off according to preference. Including the THX TruStudio Pro technology, we would rank the audio quality as halfway decent, while it is more or less in line with the usual notebook standard. The same applies to the acceptable maximum volume. Anyone who doesn't intend to use external speakers or a good pair of headphones and still expects a good audio quality would probably find the Dell XPS 15 or the Asus N56VZ to be more suitable options. The power consumption can be described as inconspicuous. Unsurprisingly, the power consumption with 3D processing is below that of a notebook equipped with a GT 650M. 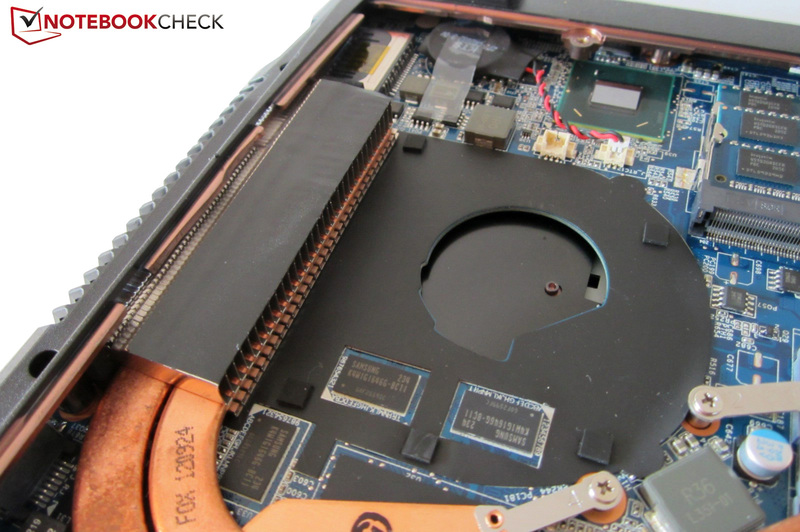 Example 3DMark 06: with 68 watts, the Nexoc M507II makes do with about 10 watts less than its competitor MSI GE60. While fully utilized this difference increases to about 20 watts. In an idle state the two 15-inch notebooks are only separated by just 3 watts (average 14 instead of 17 watts). 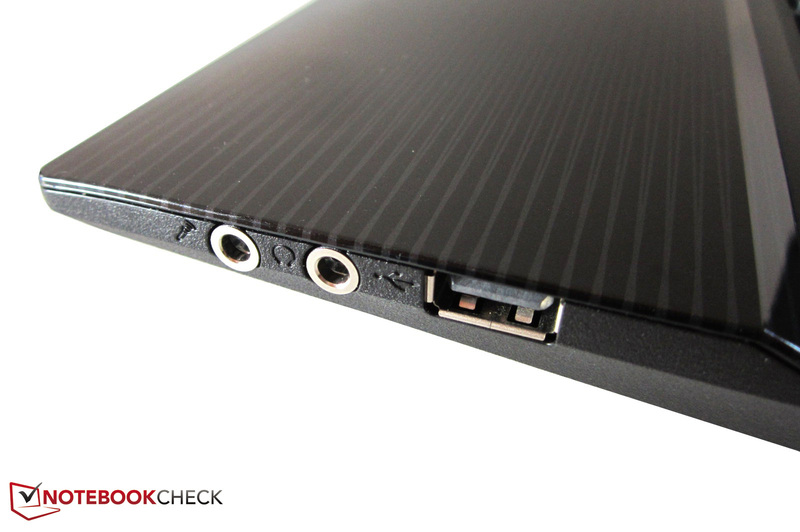 The 314 gram Lithium-Ion battery comfortably slots into the back of the notebook. The all-rounder - as we are familiar with in this price segment - is equipped with a relatively feeble 6-cell battery, which provides just 49 Wh (C4500BAT-6). Thanks to the Optimus technology the battery life is still quite substantial. While a DVD plays for about 2.5 hours (maximum brightness), a wireless internet connection is possible for approximately 3.5 hours (reduced brightness). 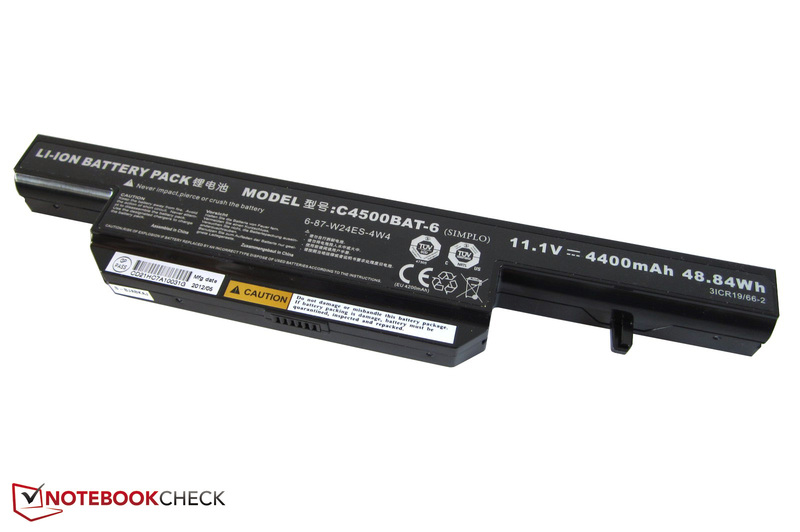 If the notebook is exposed to a high level of utilization, then the battery packs up after an hour. 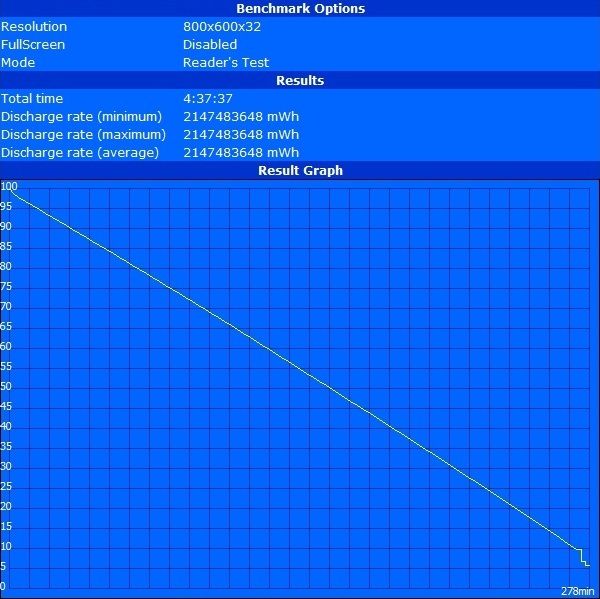 During the Readers test with Battery Eater using the lowest brightness setting, the notebook at least managed to stay on its feet for 4.5 hours. Looking for a longer battery life? Not a problem: a "High Power" replacement battery is available (costing a hefty 130 Euros, ~$165). 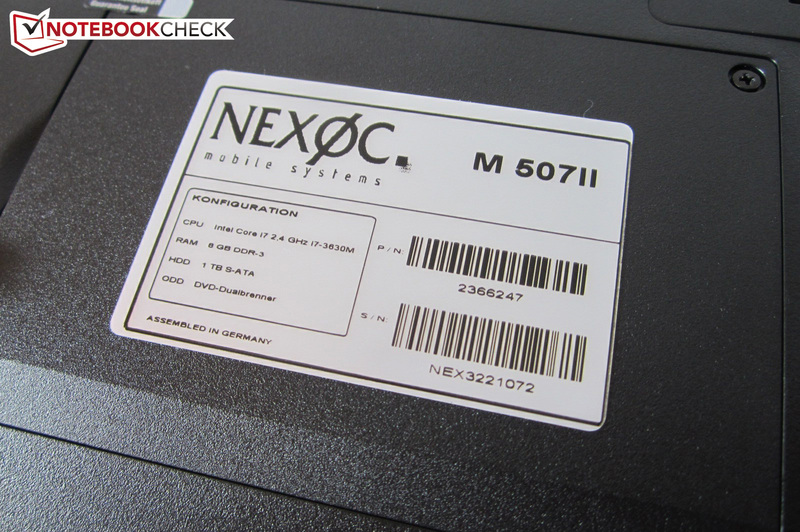 The Nexoc M507II can probably be best described with the word "solid". With the exception of the substandard HD display (narrow viewing angles, lackluster colors, low contrast) the 15-inch notebook hardly allows itself any mistakes. 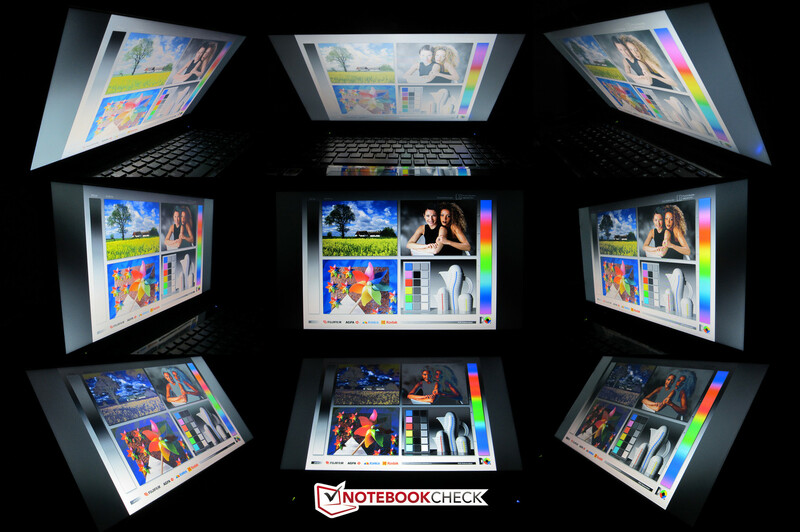 Whether input devices, interfaces, or mobility: in most categories the notebook is able to attain a decent to good rating. The decently manufactured case may get annoying due to the sensitive glossy surfaces, but it is able to shine with comprehensive upgradability and practical input devices. 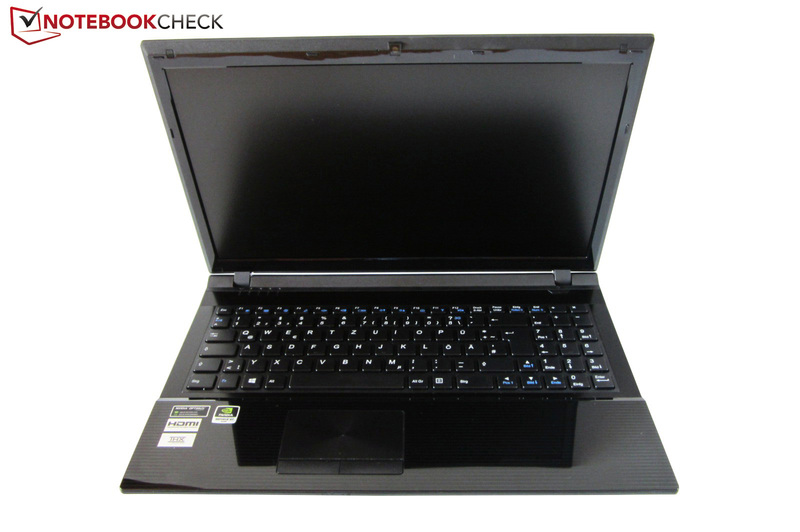 Due to its moderate dimensions and decent weight (~2.5 kg), as well as the compact AC adapter, the multimedia notebook can also be easily transported. Although the high performance components operate relatively efficiently, the M507II still gets quite warm and loud while running demanding applications. The majority of buyers should be able to come to terms with the emissions though. When creating a ranking of the 15-inch Clevo Barebones, the W251EG(Q) lands in fourth place behind the P150EM (86%), W350ET (84%) and W150ER (82%). 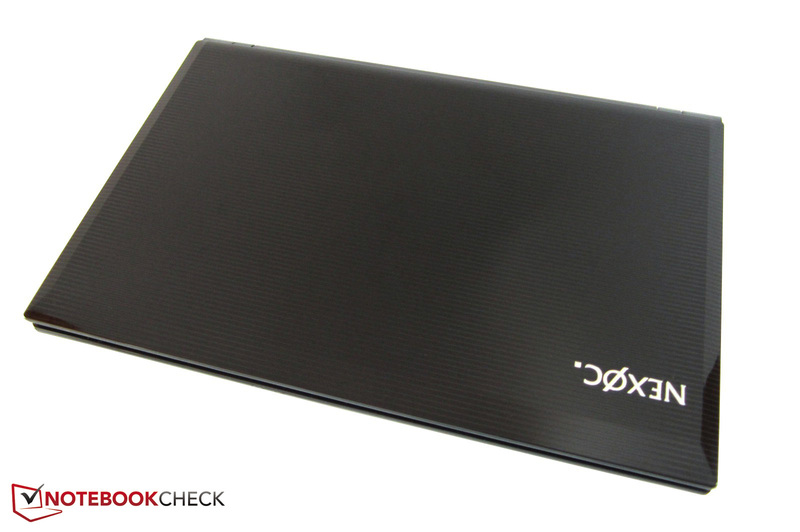 Regardless of this, the Nexoc M507II still remains a good all-round notebook that is good value for money. The glossy surfaces quickly accumulate fingerprints. The affordable wireless module supports Bluetooth 4.0. If possible an SSD should be installed. The 6-cell battery takes up most of the back edge. The cooling fan has been attached to the bottom of the case (careful cables!). For an additional price a High Power battery is available. The webcam has a resolution of 2.0 megapixels. Some of the status LEDs are located in front of the left hinge. THX TruStudio Pro improves the audio as usual. The input devices were relatively good in our opinion. The keys are clearly rounded off. Every notebook gets an individual sticker. The Barebone is manufactured in China. 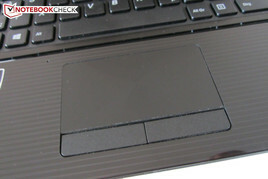 The structure of the touchpad surface could be a point of contention. The right side contains two audio sockets and one USB 2.0 port. External monitors can be attached via VGA or HDMI. The eSATA interface has been supplemented by two USB 3.0 ports. While the GPU is soldered (right), the processor can theoretically be changed (left). 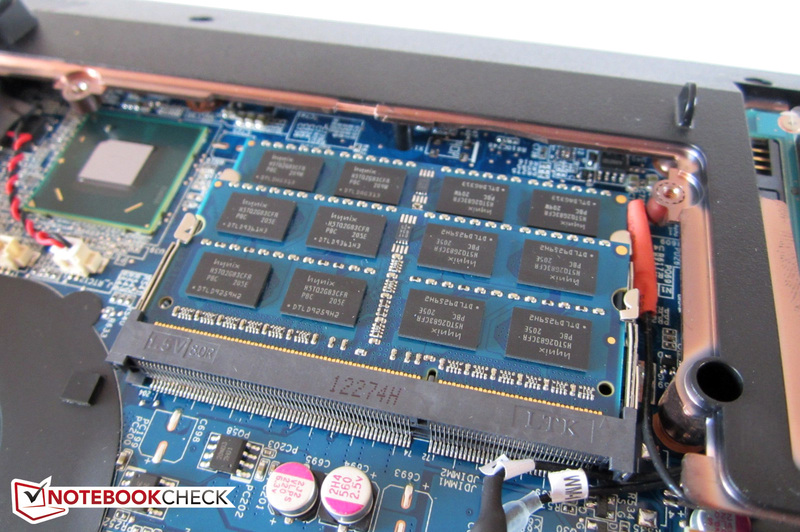 The two RAM slots hold a maximum of 16 GB of DDR3 RAM. 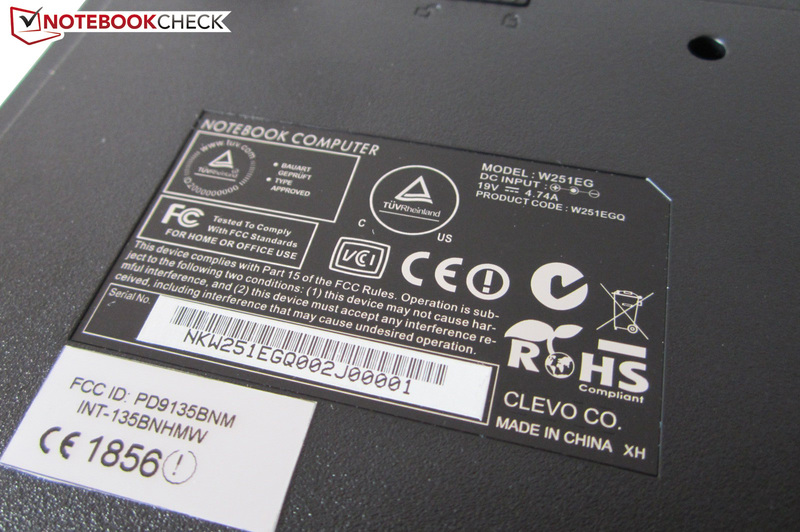 The basis of the notebook is provided by the Clevo W251EG(Q)-Barebone. The black lid has a pretty line pattern. Some of the screws are covered by warranty stickers. When clean the case looks quite elegant. Nexoc installs the components in Germany. The matte display hardly reflects at all. The manufacturing quality is halfway decent. The reflective display frame is extremely sensitive. 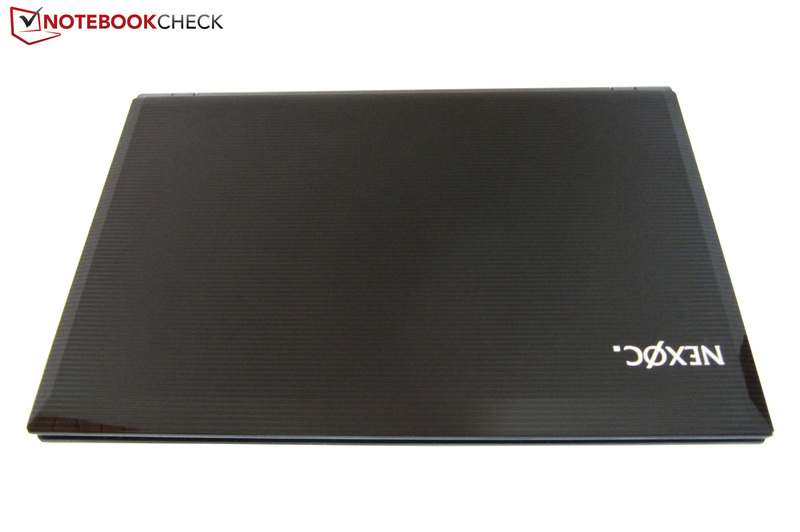 The 15-inch notebook weighs about 2.5 kg. Two maintenance panels can be removed. The keyboard unfortunately doesn't have a backlight. The notebook gets especially warm on the left side. While the right side consistently remains cool. You won't get far without a screwdriver. Practical: the hard drive has it's own panel. The heat pipes end in a combined heat sink. The compact 90 watt AC adapter weighs 370 grams. The GeForce GT 645M offers good value for money. The characteristics of the matte HD display disappoint in every respect. 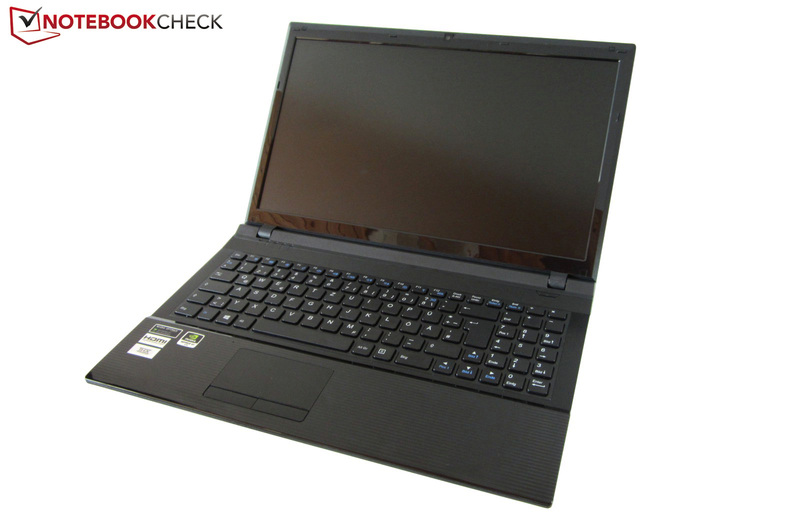 15-inch all-round notebooks with Ivy Bridge processor and Kepler graphics card. 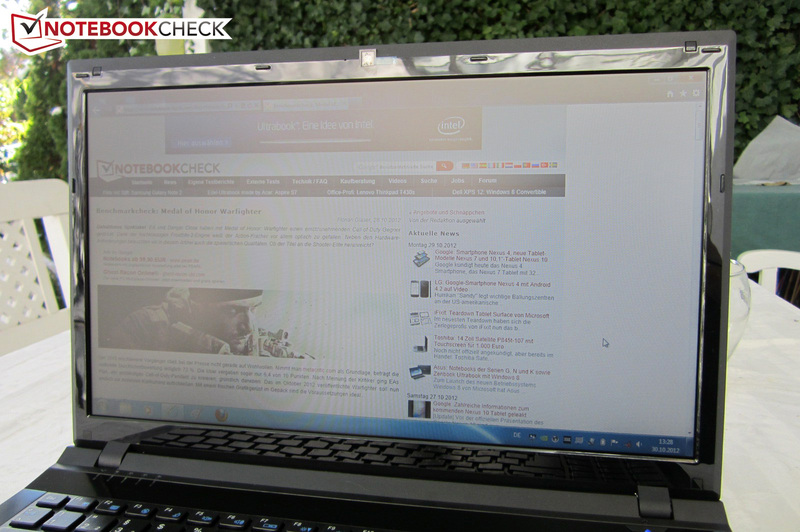 GeForce GT 640M: Acer Aspire V3-571G, Acer Aspire M3-581TG, Dell XPS 15, Toshiba Satellite P855. 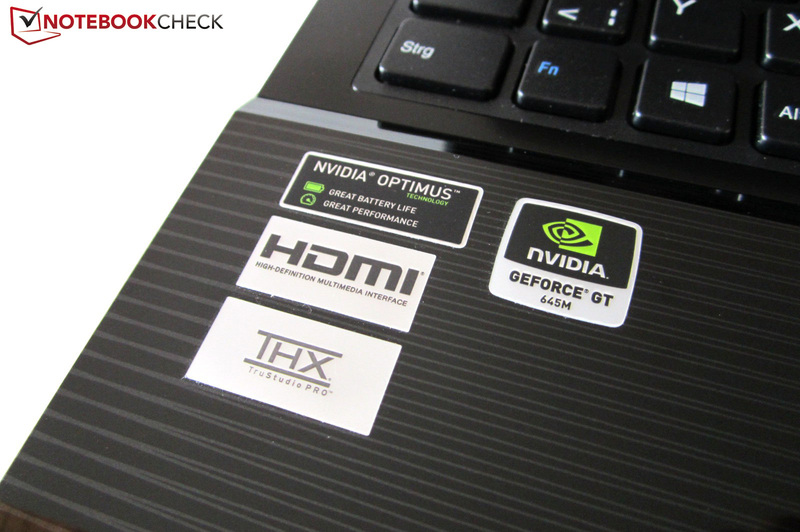 GeForce GT 650M: Asus N56VZ, DevilTech Fire DTX, MSI GE60, Schenker XMG A502.